Would you like to play Entertainment Bingo? You know, Bingo for the fun of it! Don’t come and hope to ‘make a mint’, but do come to have a good time with 20 or 30 other players. Bingo is organized by Aggie Trumpe and Kay Hack. The ‘caller’ is Cliff Davies. Each Friday afternoon we play 10 interesting games, including Little Joe, Big Joe, Letter E, Sandwich, Clover Leaf, and Sputnik. And, of course, we finish with a Jackpot! 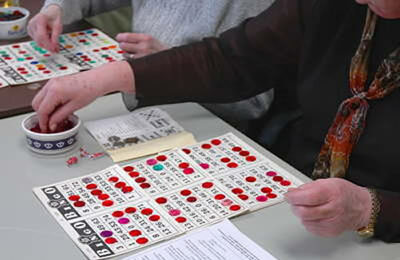 The games start at 12:30 pm and we are finished at 3:30 pm every Friday afternoon at the Aurora Seniors Centre.